Pastel-color balloons make a cheerful sight at any shower. But these, made with cupcakes and tinted whipped topping, are positively edible. Spoon 3/4 cup COOL WHIP into each of 4 small bowls. Tint each with food coloring. Frost 6 cupcakes with each color COOL WHIP. Tape 1 piece of ribbon to bottom of each cupcake liner. 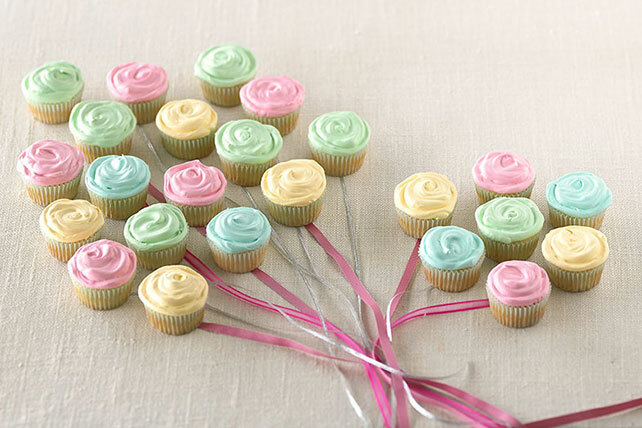 Arrange cupcakes on large platter just before serving. Tie loose ends of all ribbons together; place on platter. Refrigerate leftovers. If you don't have a large platter, use a cake cardboard instead. Look for them in craft stores or bulk food stores. Cover with foil before topping with decorated cupcakes. Line cupcake tray with sky-blue paper before adding cupcakes for a perfect backdrop to the balloons.